Chika is a real person. She is a Japanese woman who spent a decade in Australian jails for a crime she has always insisted she did not commit. She was one of a Japanese tour group who were arrested for importation of heroin in 1992. She was released on parole in November 2002 and is now living in Japan. CHIKA is a multi-layered production and contemporary story telling, crossing genres of journalism, visual and performing arts, incorporating original live music, dance and narration, documentary images, archival video and recorded interviews. CHIKA is a story of human endeavour and overcoming adversity with multiple layers of experience, CHIKA brings forth a multi-dimensional understanding of the human condition with the immediacy of unscripted and unrehearsed voices, the reflective nature of still images and the evocation of live music and physical expression. Original Music Composition: Thomas Fitzgerald, with one exquisite Koto Solo by Satsuki Odamura. 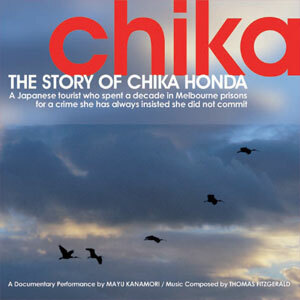 The music for CHIKA was composed by Thomas Fitzgerald, with one exquisite work, the Koto Solo by Satsuki Odamura. This unusual collaboration of instruments featuring Satsuki Odamura on koto and bass koto, Anne Norman's shakuhachi, Toshinori Sakamoto's wadaiko and Thomas Fitzgerald playing acoustic and electric violin and keyboards, blends live music and pre recorded acoustic and electronic sounds with a unique result. It is the sum of these myriad combinations of a surreal reality that have become CHIKA's musical world. The Chika CD can be purchased online using the secure Paypal connection.